As mentioned in my last post, and after much more work than I expected, here is my new sewing room which is in the attic. I have to give you a bit of background on this. When we moved into our house, the attic had a window and was floored, but had pull-down ladders instead of proper stairs (and still does - I was not going down the road of building a new staircase!). It's your average three bedroom semi, and a lady who lives across the street told me that there used to be a family with seven children in my house, so I'm guessing some of them used the attic as a bedroom. We've always just used the attic to store the usual attic rubbish, which I've tried to be quite strict about keeping under control, but in May I hurt my foot. What's that got to do with the price of fish I hear you ask? Well, I'll tell you. One of the things in the attic is my exercise bike (which I do use), and when I hurt my foot, I was under doctor's orders not to do any weight-bearing exercise, because there was chat that I might have a stress fracture. Turns out I didn't, and I still don't know how I hurt my foot, but I'm blaming it on some new trainers which I have since given to the charity shop. Anyway, I'm getting very off the point! 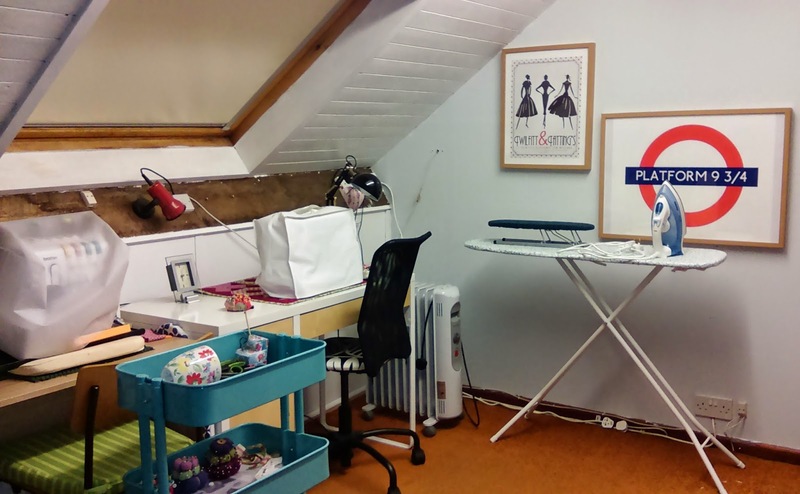 While I was cycling away on my exercise bike during the summer, it hit me that the attic would make a great sewing room, because I was getting pretty tired of having to move about five things to get to my sewing machine in it's little corner in the back bedroom. There wasn't a square inch of room under the bed in the back bedroom, because that's where all my sewing stuff was stored, and one end of the dining room table has recently become a permanent place for pattern drafting stuff. So I thought it wouldn't take me too long to sort the attic out. Turns out I was wrong, and it wasn't because there was too much rubbish - one dump run/charity shop run sorted that out. It was the wooden panels on the slopey parts of the roof. The attic is insulated in the walls and floor, so gets cold in the winter, and hot in the summer. I'm not worried about any of my sewing things though, because in the twelve years that I've lived here, nothing that has been stored in the attic has been damaged by heat or cold. The heat had made the varnish on the wood peel off, as you can see in this photo below. Great flakes of varnish were lying all over the floor. So I thought that it would take no time at all to remove the varnish from the wood. Well, Lynne in December laughs manically at poor, naive Lynne in September! I took two days off work, and expected to get the wood stripped and painted, but all I managed to do was about two square metres! I tried paint thinner, but it was useless, and the sander we had was rubbish. So eventually a new sander was purchased, and it took me a whole weekend to get all that blinking varnish off! Then it was another whole weekend to undercoat and paint it and the walls. Oh, and working above your head is not fun! 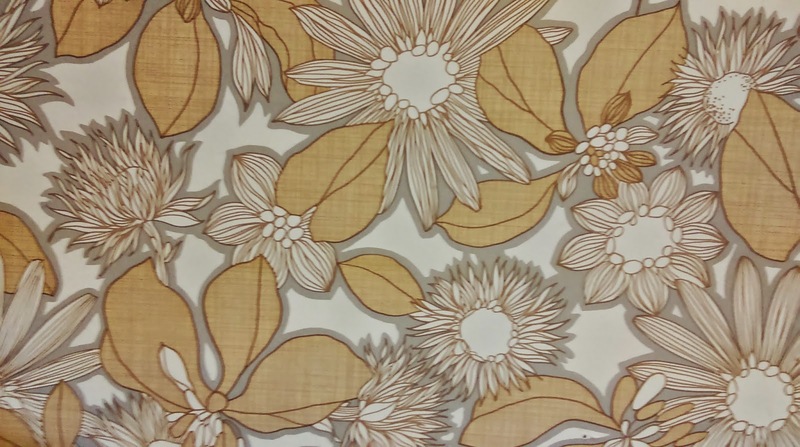 There was some very groovy 1970s wallpaper on the wall between my house and next door. I would have loved to have kept it because of my weakness for a big mad 70s print, but it was too dark. Here's a photo of it, which is a bit blurry because I took it on my phone. It was vinyl wallpaper, so I peeled off the front, and painted the backing paper. Andrew built some storage cupboards in the eaves, which also took about two weekends. Oh, and then I had a bit of a disaster when painting them. They're made from MDF, and I painted them with undercoat, then satin wood paint - and they were a streaky mess. Andrew ended up having to sand them down, and I then re-painted them with ordinary wall emulsion. and this kitchen island to use as a cutting/work table (another popular thing on Pinterest). Andrew put wheels on the bottom of it so it's really easy to move about. You can see where I skillfully managed to walk some paint onto the carpet below the mirror! Doh! There was a bit of a disaster with this table too! My sister and I had gone to Ikea to get everything, and I'm so glad she was with me. I don't know how I thought I could manage it by myself. We'd put everything in the garage until the painting was finished, which was about two weeks. Then when I opened the box with the table top in it, the top had bowed by 1cm because of the cold. There was an instruction leaflet inside the box saying to store it at least 20 degrees. Might have been handy if Ikea had printed that on the front of the box! So we brought the top into the house, thinking that the heat would help. I was giving off about it in work, and my boss suggested putting the top on the floor, and putting the dining table upside-down on top of it. We did this, and it was a great idea, because the dining table is really heavy. But the downside was that we couldn't use the table. After two days, it was down to a 5mm bow, and Andrew got two containers from the garage that we keep logs in, put them on the top and filled them with water - and it did the trick! I was very pleased to get rid of the manky old net curtain (including various dead insects), and it had been replaced with a snazzy blind. Here are some before and after photos. 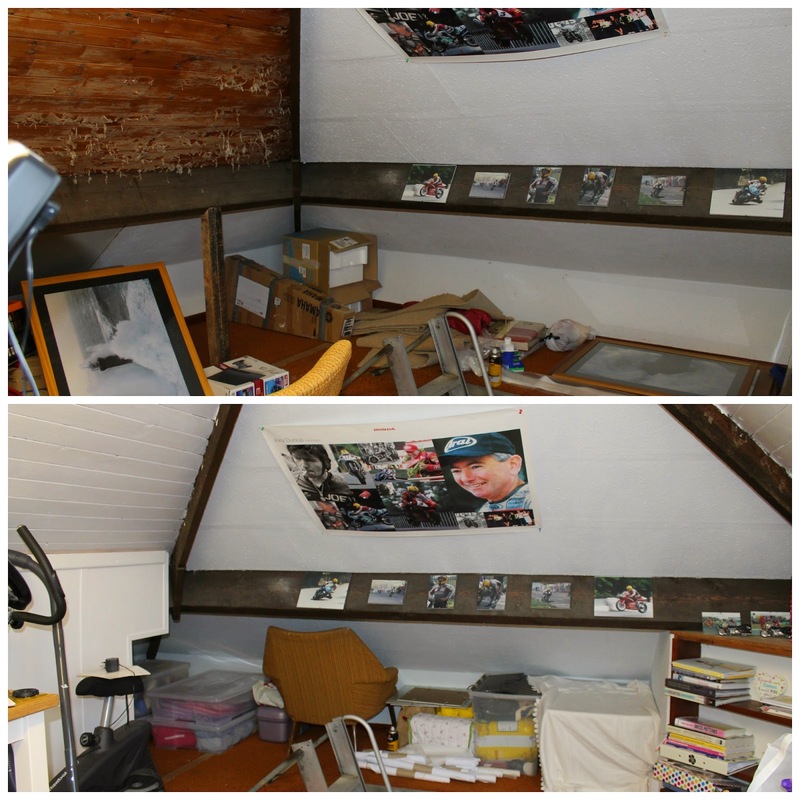 Please bear in mind that the before photos were taken after I had started to clear out the attic, I'm not that untidy! That hideous brown and yellow chair (which was in the attic when we moved in) will pop up in another photo by the way. I took off the shelves because I didn't want them, and then strategically placed the mirror and pictures to cover up the worst of the screw holes from the shelve brackets! For the Potterheads amongst us, the two pictures on the left are from a website called Society 6, and I think it only took about a week for delivery. Twilfitt and Tatting's is mentioned in chapter 6 in The Half-Blood Prince. I happen to know this because I finished re-reading it on Friday, and I thought that picture was appropriate for a sewing room. The Joey Dunlop poster and little photos on the brown beam are Andrew's. They are staying because Joey Dunlop. Maybe you have to be from Northern Ireland or be into motorbikes to even have heard of him, but he was a total legend. This is my storage area for patterns, fabric, a box of yarn, and PDF patterns. And there's that horrible yellow and brown chair again. The stupid thing wouldn't fit down the ladders! I've no idea how it got there in the first place. So that's it. It was definately worth all the work, I can't tell you how great it is to have everything in the one room, and not all over the house! So far, I have been using my sewing room to finish my apron, make another Coco top and a christmas stocking for Friend's baby, and at the minute I am up to my eyes in sleeve drafting - as the mess on the table proves! Looks fab! You will love not having to move things around and having your own space. I am just in the process of trying to get my sewing room sorted. Ikea furniture galore! Actually, question: the kitchen island you got to cut out on: does it need to be oiled? If it does, are you going to oil it? I got 2 wood desk tops from ikea and it says oil them...just worried will it wreck fabric? Or will it all just sink into the wood? What do you think? If you oil wood it just sinks in and protects the wood. It may take a few coats and will take a while to absorb properly, so don’t get worried if it feels sticky for a few days. Thank you! What's not to love about Ikea! And the one in Belfast is only about 15 minutes drive from my house. I never even thought about oiling the wood! I bet it was in the instructions, but I didn't see it. Lizzi, thanks for the tip, I'll have to look into it now. Thank you! When I saw that print, I had to have it! Thank you! I love the posters too, and was really pleased with the prints when I got them. 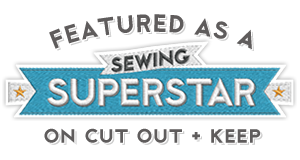 A super sewing retreat. It looks so organised and spacious. You'll be making more wonderful stuff from here I'm sure of it. Thank you! The organisation is one of the best bits. No more having to trail loads of thing out from under the bed! I expect you have tried already but if not, do the legs come off the chair? Otherwise you will have to make a feature of it. I am sure, with your decorating skills, that will be a nice challenge for you. The room looks amazing. Well done! Thank you! We had a look at the chair, but the legs don't seem to detach. It's definately going to go though because the front of the seat is damaged. It will probably have to get broken up first. Wow! That looks fab and I now have craft attic envy! 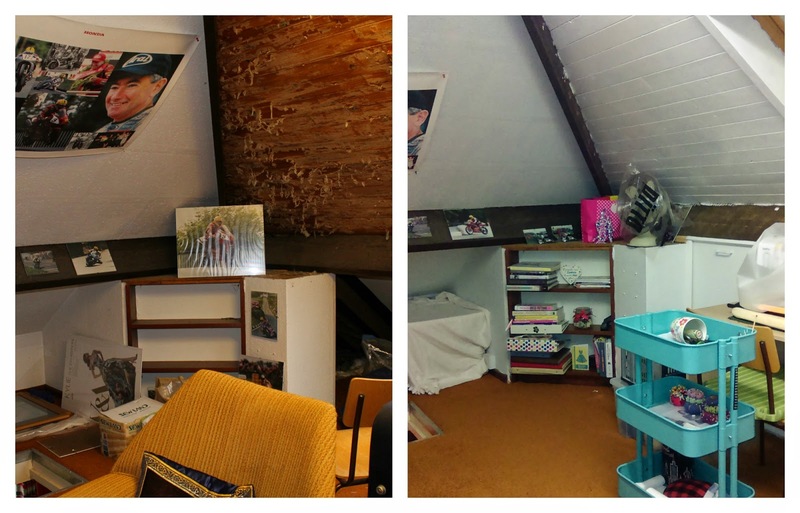 We just have a loft that has no light and boards placed across the beams so we can use it for storing 'stuff'. Thank you! I'm very grateful to whoever lived in my house before me who floored the attic. I know I would never have done it myself. What a great space - so much room, you must feel like a new woman! Love your HP posters and I did have to giggle about the mystery of the orange/brown chair....how DID it get up there?!??! Thank you - I really love it! That flipping chair really has me scratching my head. I had an idea that it might have come in through the window, but that would have been one heck of a job! And it definately doesn't look like it comes apart. oh i love it! i am so jealous - i was hoping to have our teeny tiny utility room turned into a sewing space by now but we aren't there yet. could you recover that chair? the shape is nice - it's just the colour that is slightly grim. could look great! Thank you! Ah, now I'm jealous that you have a utility room! I'd love one of those, so I wouldn't have to go out to the garage in the cold to use the washing machine. The chair couldn't be re-covered, the seat is broken, and even then it would take up valuable sewing space! That looks like another room! It's amazing what you've done there, it feels like it has even more light. 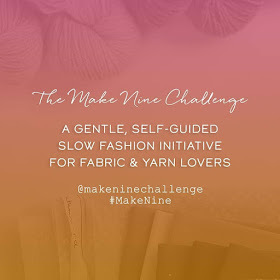 You will see that you'll more sewing done in less time than before. Having a dedicated sewing space makes a difference. I have a part of my living room but the place is so big that my machines have their place. I don't know how I could tackle complex projects before. I'm sorry that it took longer than expected but this seems to happen whenever we have big plans. At least think that it's done now and you can sew without moving things too much. That yellow chair reminds me of a blue chair I found in one of the apartments where I lived in Belgium. It was also there when I arrived, and I wanted to get rid of it because it was bulky and the apartment was tiny. Some days after I moved in my mother came to visit and she helped me with that chair. Our intention was moving it to the basement since I didn't own a car a that moment and the dumpster was far. The problem came when we found out that it didn't fit in the elevator and I lived in the 2nd floor. Fortunately it fitted down the stairs and we had to roll the thing down them. It was a bit comical! Thank you! I'm really pleased with how bright it is now, because the unpainted wood was so dark. Isn't it always the way with decorating that it takes a lot longer than planned. I'm glad I'm not the only person with chair problems! I suppose your chair's original owners decided that they didn't want to have to carry it back down the stairs again. Great room! it's so bright and roomy. You did a really nice job getting it cleaned out and set up. Yay for Harry Potter fans! I hope your foot is better. Thank you! Harry Potter is the best! I'm re-reading The Deathly Hallows at the minute, but am only a few chapters in. I'll be bereft when I finish it though. And my foot is a lot better now, thank you. What an amazing space to have, Lynne. I love it - so light and fresh, you've done a great job with it. I love the Potter pictures too! Thank you! I'm so pleased with how bright it is, and am loving my HP pictures! Thank you! It was a lot of work, but definately worth it! I love the transformation, it looks like a wonderful space to sew! Thank you! It is indeed a great place to sew! Thank you! That chair is definately going, even if it's the last thing I do! Thank you! Well, sometimes the living room floor is the best place for cutting. I did that on Saturday! Haha, I have the same blue trolley! What a transformation!